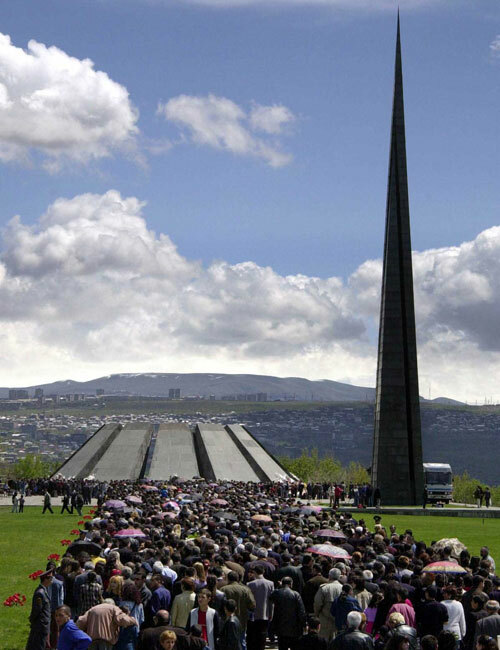 In 1965, on the occasion of commemoration of the 50th anniversary of Armenian Genocide, the monument to the victims of Armenian Genocide was founded on the hill of Tsitsernakaberd, designed by the architects Tarkhanyan and Kalashian. The monument consists of two parts: one is a high pillar and the other is a circle of lower walls in the center of which there is an eternal fire. There are stairs between the slabs of the circle leading down to the fire. 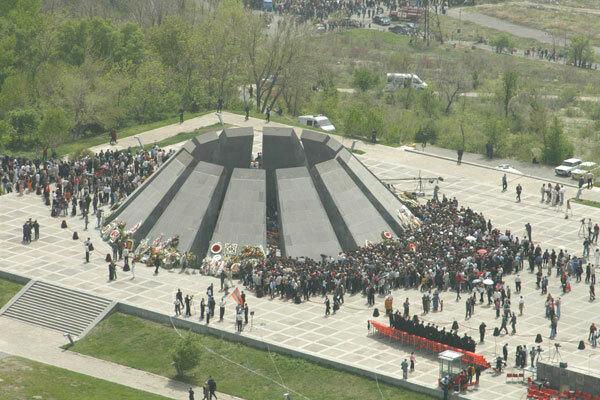 Every year, on 24th of April, many Armenians and foreigners visit the Tsitsernakaberd memorial and bring flowers. Sometimes the height of the flowers laid around the fire reaches to 1 meter. The two parts of the monument have different interpretation with different people. Some claim, that 2 parts symbolize the Eastern and Western parts of Armenia; others believe those are the Ararat Mountains – Great and Little one. The specific monument consists of an underground museum with library and archive sections; an axial path leading to the central area of the monument that is paralleled with a 100 meters by 3 meters basal wall with inscriptions of the names of the regions, towns and villages of Historic Western Armenia (the regions where the tragedy occurred). The central memorial structures consist of a circular area that shelters the eternal flame memorizing all the victims of the tragedy. It stands as the Memorial Sanctuary. The eternal flame is housed under 12 tall, inward-leaning basalt slabs forming a circle. The shape of these walls simulates traditional Armenian khachkars. The level of the floor of the Monument is set at one and a half meters lower than the walkway. An arrow-shaped stele of granite, 44 meters high, reaches to the sky, symbolizing the survival and spiritual rebirth of the Armenian people. Partly split vertically by a deep crevice, this tower symbolizes the tragic and violent dispersion of the Armenian people, and at the same time, expresses the unity of the Armenian people. The museum and archival area that was built 30 years later, is on the same hill. It houses several large exhibitions, administrative, engineering and technical spaces. The exhibition space is over 1,000 square meters. It occupies three indoor halls and one outdoor hall and a hallway. A basalt stone eight meters long and three meters wide lies on the floor of the outdoor hall, symbolizing the eternal memory of the victims of the tragedy and the unity of the Armenian people spread throughout the world. It also expresses the struggle between good and evil, light and darkness.